Purchase gift cards for holidays, special occasions or just to say “thanks.” Send a regular gift card, and eCard or create your own. Click to learn more! 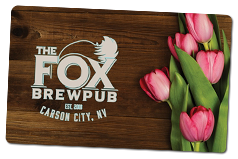 The Fox Brewpub is a traditional, English-style pub located in the Historic St. Charles Hotel in downtown Carson City—Nevada’s State Capital.